I own four copies of the first edition of The Private Life of Sherlock Holmes. Like most of my books, they’ve been accumulated over the last 30 years or so. Each has characteristics that make them valuable to me. The inscription has few words, but says so much. I have a strong sentimental attachment to this copy which I have had for more than 30 years. It was the first collectible edition of a Starrett book I ever owned. And it didn't cost me a penny. The circumstances of how I obtained it is a story for which the world is not yet prepared. Rest assured there’s no skullduggery involved. It was actually a very generous gift. The individual who gave it to me asked that I not reveal his generosity, and even though he is no longer with us, I will keep that promise. I was stunned by his thoughtfulness and think of him each time I pick it off the shelf. Beyond being able to own a lovely first edition at a relatively young stage in my collecting life, I have valued this copy for one other reason: the inscription. I can’t count the number of times I have wondered about Ronald and Mildred. How she was able to afford the $2.00 to buy this book at the height of the Great Depression, when two bucks was equal to a couple days of food for two? And I think about how her few lines tells so much about that era and the nature of their relationship. Ronald took good care of his book, whose pages are otherwise unmarked. They remain supple and tight in their binding, a tribute to Ronald’s care, the quality of paper and the bookbinder's arts. I keep this copy on the desk where I work and pull it out whenever I need to check a fact about Private Life. We have become old friends. On April 18, 1935, about 18 months after its publication, Starrett inscribed a copy to one Eddie Liegler. Underneath, a “helpful” book dealer has noted in pencil that Starrett made corrections on page 51 of the book. The inscription is intriguing for a couple of reasons. At first, I thought the name was Eddie Liegler, and I could find nothing about the fellow that would bring him into Starrett’s orbit. Edme Ziegler, more commonly known as Eddie (well, with a name like Edme, could you blame him? ), lived in New York, the Midwest and retired to California, where he died in 1956. "His affable disposition and his integrity established him as a favorite with the thousands of persons with whom he came in contact," according to a brief death notice in the Chicago Tribune for July 6, 1956. The Doubleday and Morley connection would explain the “in friendship.” The quote from Hornung is a little unusual. I don’t recall seeing it in another copy of Private Life. Perhaps it was an "in joke" he and Eddie mutually enjoyed. The friendship between Vincent and Eddie must have had substance: The corrections on page 51 are, in my experience, unique. They come at a point in the article where Starrett is trying to figure out when Holmes retired to Sussex Downs to keep bees. In the text, he argues for October 1904. However, in Eddie’s copy, he has crossed out the two references to October in favor of December. Remember this. It will turn up in the next chapter. Stanley Donaldson put his name on the front end paper of this copy, but it is not inscribed by Starrett, nor does it have any other remarkable features. I have no idea who Stanley is, but I'm grateful to have his book. What does make it worth keeping on the shelf (in my view) is the fact that it is one of the second printings, done in 1934. As you can see, it came off the press in January, just five months after the first run. I don’t know the size the print runs for either of the two printings, but based on the number of copies I’ve seen on the resale market, the second printing was smaller than the first. I can also find no differences in the text between the two printings, except for this page. And I guess this is as good a place as any to raise the prospect of the book also being printed in Canada. I once saw a dealer list a 1933 edition supposedly printed in Toronto, but when I asked about the book, it was gone. And in a review in the Vancouver Sun, there is a note that the book was published by Macmillan in Canada. OCL WorldCat does not list a Canadian edition and I've never seen another copy for sale that supposedly came off Canadian presses. For a completest, it's an intriguing possibility. If anyone owns a Canadian edition, please get in touch with me at StudiesinStarrett@comcast.net. 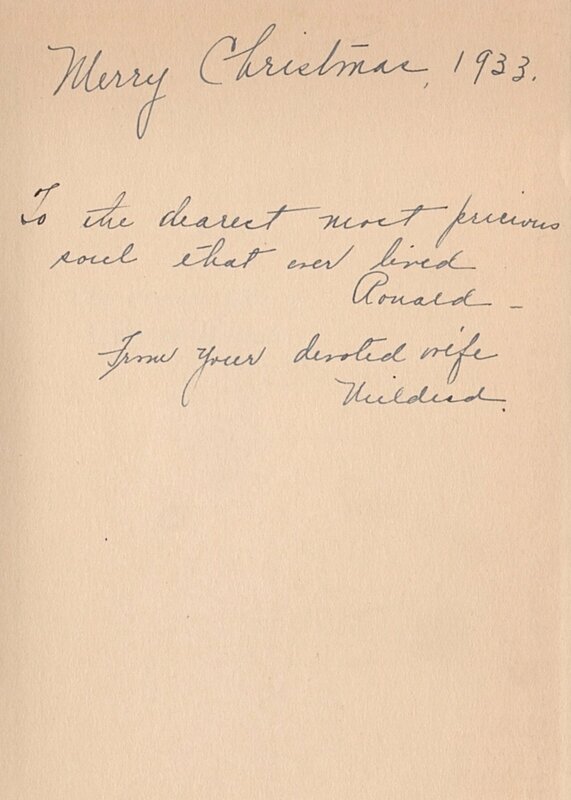 The bookplate of the Haverford copy of Private Life, donated by Starrett to Morley's alma mater. A notation on the book says it had been deaccessioned from the collection and it was "No longer the property of Haverford College." A few years ago, fellow Sherlockian Ross Davies approached me at a meeting of the Sons of the Copper Beeches in Philadelphia. He showed me a copy of the second printing (1934) of Private Life. From the number printed on the spine (PR4624S7) it was clear this was once a library book. Even a Watson would get that. Inside the front cover was a card showing it had once been part of the collection at Haverford College, where Christopher Morley's father was once a professor and where Morley matriculated. Encouraging me to both "see and observe," Ross pointed out that the book was "The gift of Vincent Starrett"! I was stunned. I had no idea Starrett had been so generous with his books. And then I was bowled over when Ross handed me the book and said it was mine. What a gift! I thanked him then and happily do so again. Sadly, it looks like the book was only taken out twice, both times in 1948. It always amuses me to look at the back of the dust jacket for the first edition. 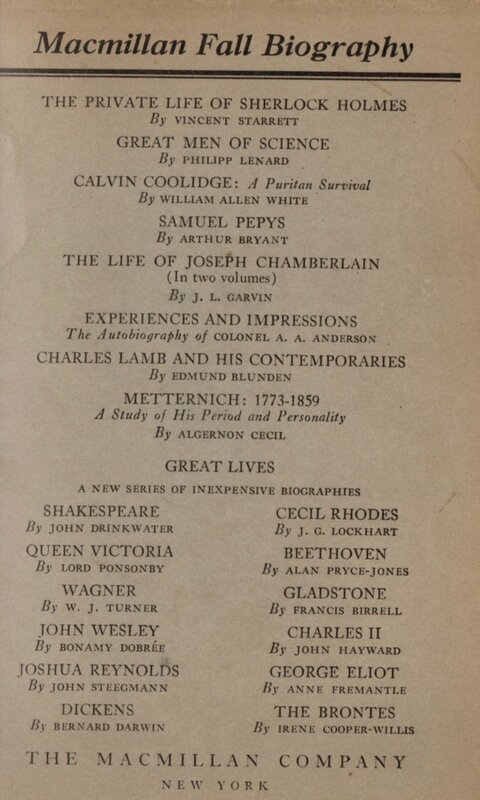 “Macmillan Fall Biography” is at the top, and the first book listed there is not a bio of Calvin Coolidge, Samuel Pepys, Joseph Chamberlain or Charles Lamb, but Sherlock Holmes. The fact that Macmillan treated this as a biography, and not as some kind of speculative fiction, seems to say that the stately publishing house had a good sense of humor about the whole business. We will see something similar when Pinnacle issues the first paperback edition of Private Life. But that won’t come for another 40 years or so.